Homes in Seattle, where houses are lingering on the market. 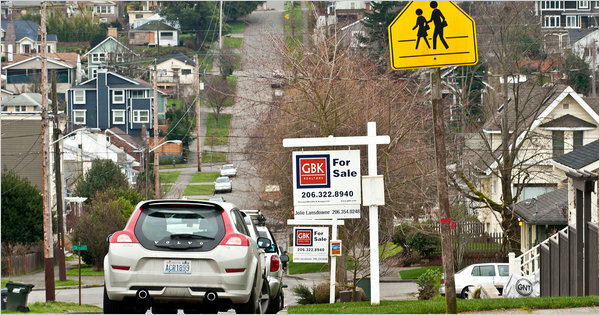 SEATTLE — Few believed the housing market here would ever collapse. Now they wonder if it will ever stop slumping. Seattle is down about 31 percent from its mid-2007 peak and, according to Zillow’s calculations, still has as much as 10 percent to fall. Mr. Humphries estimates the rest of the country will drop a further 5 and 7 percent as last year’s tax credits for home buyers continue to wear off. The fact that even a fairly prosperous area like Seattle was ensnared in the downturn shows just how much of a national phenomenon the crash has been. The slump began when the low-quality loans that drove the latter stage of the boom began to go bad, but the resulting recession greatly enlarged the crisis. Many people could not get a mortgage, and others simply gave up the hunt. Now, though the overall economy seems to be mending, housing remains stubbornly weak. That presents a vexing problem for the Obama administration, which has introduced several initiatives intended to help homeowners, with mixed success. CoreLogic, a data firm, said last week that American home prices fell 5.5 percent in 2010, back to the recession low of March 2009. New home sales are scraping along the bottom. Mortgage applications are near a 15-year low, boding ill for the rest of the winter. It has been a long, painful slide. At the peak, a downturn in real estate in Seattle was nearly unthinkable. In September 2006, after prices started falling in many parts of the country but were still increasing here, The Seattle Times noted that the last time prices in the city dropped on a quarterly basis was during the severe recession of 1982. Two local economists were quoted all but guaranteeing that Seattle was immune “if history is any indication.” A risk index from PMI Mortgage Insurance gave the odds of Seattle prices dropping at a negligible 11 percent. These days, the mood here is chastened when not downright fatalistic. If a recovery depends on a belief in better times, that seems a long way off. Those who must sell close their eyes and hope for the best. Those who hope to buy see lower prices but often have lighter wallets, removing any sense of urgency. Arne Klubberud and Melissa Lee-Klubberud paid $358,000 for a new, 960-square-foot townhouse on trendy Capitol Hill a few weeks after that Seattle Times article was published. Now, with one child and with hopes for more, they need more space. They just put the townhouse on the market for $300,000. On a dark, dank Sunday, a handful of people came to look at the three-level unit. One of them was Katherine Davis, who had just sold her house in the far eastern suburbs. It took 14 months, during which she had to drop the price several times. The equity she had accumulated over the decades disappeared quickly. “At first, I thought it would be nice to come out of this with $200,000, but I adjusted my expectations,” Ms. Davis said. She ended up with less than half of that. Her goal is to buy a small place in the city, but not yet. “Selfishly, I’m hoping the market continues to drop,” she said. Increasing numbers of sellers are simply surrendering. Megan and Ryan Dortch tried to sell their one-bedroom Eastlake condo for $325,000 two years ago. They rejected an offer of $295,000 as inadequate. A year later, they relisted it for $289,000, then $279,000, which was less than they paid. Without a sale at that price, they could not afford to buy a place big enough for them and their new baby. They have given up on real estate. They are renting out their old apartment at a small loss every month, and living in a rented house. “I don’t expect the market to get better,” said Ms. Dortch, 31, a customer service consultant. Neither does Gene Burrus, another frustrated seller who became a landlord. “Rent is so cheap it doesn’t make sense to buy now,” he said. He might reconsider if 10 or 15 percent more comes out of the market. Redfin, a real estate brokerage firm based in Seattle, says foot traffic began picking up in the last several weeks. Mortgage rates are rising, which could nudge those who need to buy to make a deal now for fear rates will rise even more. While almost every economist is expecting another round of price declines for the next few months, many see a leveling off in the second half of the year. Fiserv, the company that produces the monthly Case-Shiller Home Price Indexes, analyzed prices in 375 communities. About three-quarters of them will be stable by December, Fiserv calculates. Maybe that is why belief in a bottom is as elusive now as fears of a top were in 2006. “We would love to have a house,” said Dan Cunningham, a 41-year-old renter. “I have more than enough for a down payment. I’m preapproved for a loan. But I have to have confidence it’s not going to lose another 20 percent.” He plans to wait until he sees prices rising before making any offers. Copyright 2011 The New York Times Company. Reprinted from The New York Times, National, of Monday, February 14, 2011.